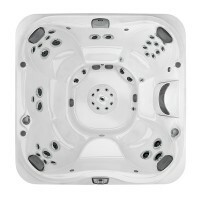 The J-375™: A luxurious hot tub with a wide range of features. 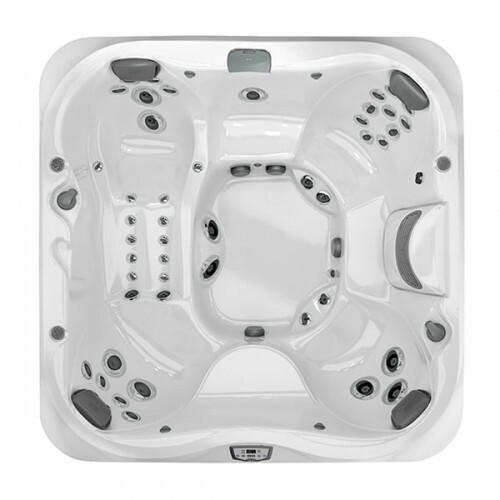 The J-375™ is the go-to-model if you’re looking for a luxuriously large portable hot tub with Jacuzzi®'s most desirable features. 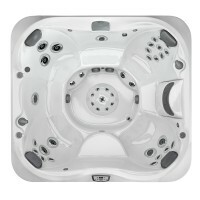 The Jacuzzi® J-375™ Hot Tub offers room for up to six adults to fit comfortably. The tension-reducing PowerPro® Therapy Seat, lounge seating, and superior PowerPro® Jets, including FX Jets, provide a hydrotherapy haven for your mind and body and will melt away stress. The PowerPro BX "bubbler" jets provide an effervescent, tension-relieving massage to the calf muscles, while the PowerPro MX jets deliver deep-tissue rejuvenation to soothe tired back muscles. The ProPolymer Foundation protects the structure from the elements, making the J-375™ built to withstand the heat or the cold and offering year-round use and it is built to last for prolonged enjoyment. Enjoy the calming effect of the Water Rainbow® waterfall, illuminated cup holders and enhanced LED lighting and illumination throughout that induces visual stimulation. One of the greatest luxuries of owning a portable Jacuzzi® hot tub is the wealth of options available for personalized features. Targets muscles for total body, tension-easing relief. Both targeted and wide-swath rotational jets ease the neck, back and feet, and comforting jets knead the calves and wrists.